rec. 2004, Concert Hall, Ferencz Liszt Music Academy, Budapest. The first incarnation of this symphony was as a “Symphonic Poem in Two Parts”, conducted by Mahler in Budapest on 20 November 1889, to a cold reception. Mahler then revised it and that revision, as recorded by De Vriend on Challenge Classics, was performed in Hamburg in 1893. The recording here, however, is of the 1896 version first performed in Berlin, with “Blumine” inserted as the second of the five movements. 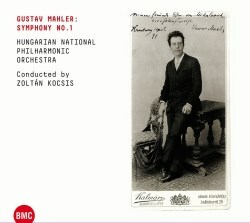 It is not to be confused with the first recording of The New Critical Edition of the 1893 version that the International Mahler Society prepared from the surviving autograph score of the Hamburg version, conducted by Hengelbrock on the Sony label. The title here, “Titan”, is a misnomer. The work composed by Mahler entitled “Titan - A Symphonic Poem in The Form of a Symphony” is not the First Symphony as we hear it today in Mahler's 1906 final revised version and can apply only to the 1893 version - which is also the only version where "Blumine" may be legitimately included, other than as an added extra, as in this recording under review, which is a composite live recording from two performances marred by a fair amount of coughing, especially in the first movement. It is not clear why it wasn’t released for ten years but it is especially competitive given that there are other issues including “Blumine” which are superior both sonically and artistically. The sound here is rather dry and airless sound and Kocsis delivers a fairly routine, low-key account, somewhat blithe and perfunctory, and lacking the drive, weight and energy brought by such as Jurowski in his live LPO recording made in 2010, which also includes “Blumine”. There is simply no comparison between the impact Jurowski generates at the climax of the first movement and what Kocsis achieves. That deficiency is in part due to the dry, dull sound but it is also simply the lack of sonority in the orchestra and his low-key direction. Jurowski finds much more nuance and more Viennese Schwung in the klezmer music; he also conjures up an eerier atmosphere in the "Bruder Jakob" interlude in the fourth movement. It is good to hear the “Blumine” movement with its melancholy trumpet solo and it is neatly played, but comparison with Jurowski reveals a much greater attention to nuance and detail in phrasing and much fuller sound. Kocsis’ finale is similarly workmanlike but does not generate many thrills, although the first tempestuous three minutes are suitably arresting. It is just a pity that the soft-grained sound mitigates its impact, despite the energy of the playing. Ultimately this recording is serviceable but cannot displace better played and better recorded accounts.